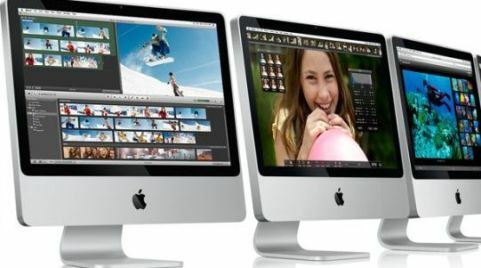 The American multinational corporation, Apple has announced an updated/redesigned version of its iMac computers as well as new versions of its iLife and iWork software. As you see in the photo, the new iMacs that come with a slimmer design, polished look, faster chips and glossy screens are the headquarters of an Apple product, which aimed to increase its market share in the PC industry. In simply words, the new desktop computers now replacing its old white plastic with a lighter and more environmentally friendly material – aluminum and glass. Furthermore, the all-in-one new iMacs will come with a new ultrathin aluminum keyboard, a built-in iSight camera for video conferencing, wireless Apple Remote, Apple’s Mighty Mouse and the latest version of Apple’s iLife suite (iLife ’08) of digital lifestyle software, which aimed to help new iMac users organize “user-generated content”.